Pine trees are evergreen conifers that are popular because they grow quickly and stay green all year long. However, there are a number of pests and diseases that can topple these trees, making them an enormous liability. If you have pine trees on your property, the best way to keep them healthy and happy is to be aware of the signs and symptoms of pine tree problems. 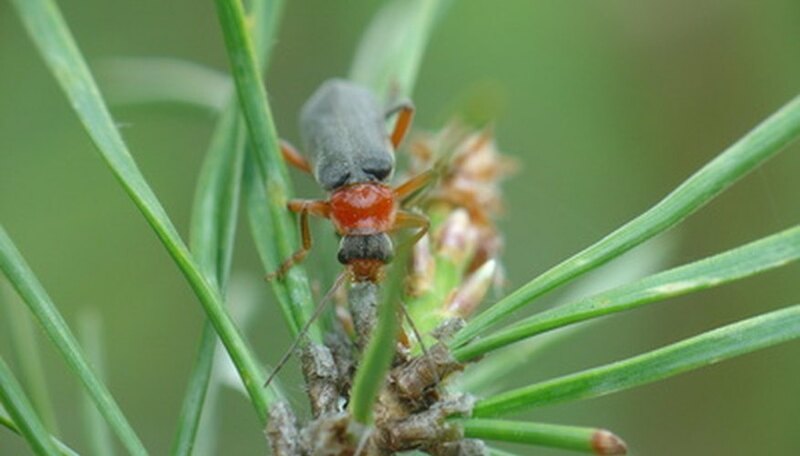 TreeHelp.com considers the southern pine beetle to be "one of the pine's most destructive insect enemies." This beetle impacts pine trees in the southern United States, Mexico and Central America. Pitch tubes, which are small, gummy, light tubes of resin leaking from the pine tree, indicate the entry of these insects into the pine. If an individual tree is infected, there is little to do but remove it. However, if you have a large stand of pines, then removing infected trees may salvage the remainder of your trees. Very high or very low temperatures will kill pine beetle larvae, but it is risky to rely on this method since the beetles spread and kill so quickly once they infest a tree. Pine wilt is caused by a nematode. This worm infects the pine tree through Sawyer beetles, which feed on pine bark. Once the worm is in the pine tree, it reproduces, causing the tree to turn brown, defoliate and eventually die. There is no cure for infection, so if pine wilt has impacted one tree, you will need to remove it quickly to prevent spread. Pine needle scale causes pale, oyster-shaped scales to form on the needles of pine trees and can actually kill branches and cover entire trees if allowed to continue to grow unchecked. An infected tree will look as if it is under frost from a distance, or appear to be silver. Horticultural summer oil sprays can rid a tree of these pests, and you can likely prevent infestations entirely by making sure your pines have plenty of room to grow and do not touch branches. Use sterile pruning to remove affected parts of the tree and dispose of the debris by burning or in garbage bags to prevent the scale bugs from simply returning to the tree from the ground.